Nothing is more exciting than feeling the summer temperatures slowly begin to drop and seeing the leaves begin to turn. What better way to enjoy the beauty of fall than by experiencing the changes in the beautiful state of Arkansas? From numerous trails and picnics to comedy clubs and concerts, Little Rock offers something for everyone. Begin your fall get-away in the heart of Little Rock, the River Market. From May to October, the Farmer’s Market opens at 7am on Tuesdays and Saturdays to provide you with some of the freshest fruits and vegetables you’ve ever seen (let alone tasted)! Next stop is breakfast at one of the best places in town! The Root Café is open Tuesday-Friday from 7am-2:30pm, Saturday 8am-3:30pm, and Sunday 9am-2pm. Don’t let the drab-looking exterior dampen your spirits or fool you. It’s the only way the owners could disguise the awesomeness that awaits inside! The unique atmosphere is best for smaller groups, as the dining area is not the largest in Little Rock. Even though the Eggs Benedict and pancakes are definitely worth the wait, it’s best to get there early to avoid a long line! If you happen to miss breakfast, no worries! You won’t be disappointed with the fried okra appetizer as you wait for a mouth-watering mushroom sandwich or a burger like you’ve never had before! While in the River Market area, make sure to check out some of the great local museums such as The Historic Rock Museum, The Arkansas Arts Museum, The MacArthur Museum of Military History, and The William J. Clinton Presidential Library & Museum. Many of these museums offer free admission. The Clinton Presidential Library & Museum sits on almost 30 acres that it shares with The Clinton School of Public Service and The Clinton Foundation. The museum contains over 100,000 artifacts, documents, and pictures. At any given time, the museum has on display over 500 artifacts, 200 documents, and 1400 pictures pertaining to the life and presidential career of former President Clinton. There are 3 exhibit levels containing fascinating history surrounding the timeline of Clinton’s career, letters and gifts, his limousine while in office, events and celebrations during his time at The White House, replicas of The Oval Office and Cabinet Room, and more! Excluding major holidays, this museum is open Monday- Saturday 9am-5pm and Sunday 1pm-5pm. Senior adults 62+: $5, Adults 18+: $7, Children 6-17: $3, children under 6 and active military: free admission. Admission rate for groups of 20+ is $5/person. College and retired military admission is $5 with ID. Hand-held audio tours are available for an extra $3 and are extremely worth the additional fee! The museum also houses a small restaurant, Café 42, which overlooks the Arkansas River. It is open weekdays from 9am-4pm for coffee and lunch from 11am-2pm. Another great scenic attraction is the Big Dam Bridge. It’s free and full of beauty! It’s the nation’s longest bridge specifically built bicycle and pedestrian bridge. It took 8 years from design to finished structure. There are approximately 20 miles of scenic riverside trails through Little Rock and North Little Rock that the outdoors person will love! 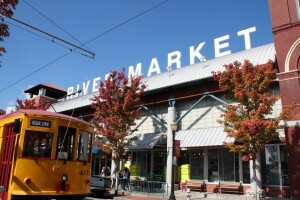 Being easily accessible to the River Market and museums makes it in a great location, too! Hungry, yet? Another great dining option in the River Market is Dizzy’s Gypsy Bistro. This local restaurant will quickly become a family favorite! Open Tuesday-Thursday 11am-9pm and Friday-Saturday 11am-10pm, this colorfully casual restaurant has a menu item for everyone! The patio area overlooks the market and is the perfect place to snack on Dizzy’s infamous cheese dip or homemade salsa! Yum! Craving something specific? If you’re in the mood for some famous Arkansas BBQ, I know just the place! Whole Hog Café offers the best BBQ beef, pork, or chicken you can imagine! With 7 different sauces and 6 sides, the options are endless at this award-winning restaurant! Open Sunday- Thursday from 11am-8pm and Friday-Saturday from 11am-9pm. Ready for some night-life options? The Loony Bin is a must for comedy lovers. Shows performed Wednesday-Saturday at 7:30pm with an additional 10pm show on Friday and Saturday nights. Great food and drink menu available. Ticket prices depend on the comedian performing, but are always very reasonable. Be prepared to laugh yourself breathless! All shows are for ages 18+ or 21+. If the bar/dance scene is more to your liking, Willie D’s is calling your name. Open Tuesday-Saturday 7pm-2am, Willie D’s offers more fun than you can imagine! Reservations are available to ensure room for your entire group of friends, family, or coworkers! Please make sure to give 48 hours advance notice for reservations. Split into 3 spaces, Willie D’s has a section for whatever mood you and your group are in. The main area offers dueling piano shows where you and your friends can make requests and sing along to your favorite tunes. With 2 full-service bars, a kitchen that serves until at least 11pm, nightly specials, and great service, what’s not to love? Prost is the name of another happenin’ section of Willie D’s that has a full-service bar, big screen TV’s, pool tables, and beer pong tables available. Don’t miss karaoke on Friday night! The last section, Deep, is only open on Friday and Saturday nights. If you love to shake your booty to Top 40 hits and hip hop, this is where you should be! This Little Rock favorite has been recently renovated to be better than ever before and the dance club is 100% smoke free! When you’re finally ready to call it a night, staying in the area would be wise! Little Rock Marriott, Holiday Inn Presidential, Hampton Inn & Suites, Residence Inn, and DoubleTree are all great options in the River Market District. The Capital Hotel is a definite historic luxury hotel favorite! Many online booking sites have rates for these hotels listed from $85-$200/night. Most offer group rates and other discounts. Enjoy your stay in Little Rock and be sure to check back for more food, fun, and future adventure ideas!